Deep in the countryside near Rugby stands the Tudor manor house of Lawford Hall, occupied this summer by Sir Theodosius Boughton, his mother Anna Maria, his sister Theodosia, brother-in-law John Donellan, the Donellans’ two young children, and a handful of servants. It is early in the morning of 30th August and something is about to happen that will bring notoriety and scandal to the Boughton household. Sir Theodosius, aged 20 and suffering from venereal disease he contracted at Eton some five years earlier, has just woken and is visited in his bedchamber by his mother. Anna Maria was keen for her son to take the medicine made up for him by the local apothecary Mr Powell in the hope that it might cure him; he, on the other hand, seems reluctant to take it as a dose he received from the same man the previous week made him ill. Anna Maria selects a bottle from the chimney piece, pours it out and hands it to her son to drink. He takes half and protests that the mixture tastes foul, but on his mother’s insistence he finishes the drink. He initially appears as if he is going to vomit, but then seems to settle down once again. Satisfied, Anna Maria leaves the room, returning some time later that morning to find her son is in a much worse condition than when she left him. A servant is sent out in a desperate bid to bring the apothecary to help Theodosius. The room is visited by servants and John Donellan, who later report that the young man was unable to answer when they spoke to him. The coachman eventually returns with Powell, but it is by then too late – the heir to the extensive estates around Lawford Hall, who would have inherited a considerable sum upon turning 21 in just a few months’ time, was dead. The circumstances of Theodosius’ death soon invited rumour that the young man was poisoned via his medicine. His legal guardian until he reached his majority, Sir William Wheler, ordered that a local physician and surgeon carry out an autopsy – but more to quell these rumours than in any attempt at resolving a possible murder. The medical men soon arrive at Lawford Hall, but declined to carry out any more than a very cursory examination because, “the body seemed to us to be in such a very disagreeable state that we did not like to enter into the investigation of it”. An autopsy was eventually carried out, but not until 9th September – three days after the body was buried, and in the churchyard in front of 500 spectators, such was the growing interest in this case. Theodosius may have been an unloved, drunken, womanising bully in life, but in death he seemed very popular indeed. 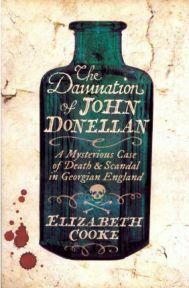 In The Damnation of John Donellan, Elizabeth Cooke takes us on a thorough examination of this curious case, its outcome and consequences, in a book that plays like a Georgian Suspicions of Mr Whicher. Grounded in thorough historical research that is evident throughout the text, the reader is not only left with a full-colour mental picture of high class society at that time, but as a good an idea as possible of what the major players in this drama were like given that over 200 years have passed since these events unfolded. We have maps, family trees, court documents, coroner’s reports, letters, diary entries, portraits, account books and John Donellan’s pamphlet Defence as evidence; that Captain John “Diamond” Donellan was accused of this crime is evident from the title of the book, whether he did it or not is something that invites great speculation. Cooke is not the first writer to look back on this case and question the actions and inconsistencies of people involved in Theodosius’ case; several contemporary and 19th century authors have found reason to question and discuss what happened at Lawford Hall all those years ago. This book should stand as the most thorough of them all, though, given its length (289 pages) and careful consideration given to each piece of evidence that we can still access. I have read many true crime books over the years where the author has written nothing more than a thesis as to why they are right in their conclusions and other people wrong, giving a skewed and biased picture of the evidence to their reader (Patricia Cornwell’s book on Jack the Ripper springs particularly to mind here). The Damnation of John Donellan is different, and commendably so. A writer for over twenty years, Cooke’s previous output were novels, so this book represents something of a deviation for her. She has handled the leap across into non-fiction work well, but the author’s background as a novelist is evident in her ability to bring to life this piece of history as an absorbing story. Highly readable and clearly explained throughout, this is a fascinating book that will appeal to readers of true crime, historical fiction and crime fiction alike. My only criticism is that her conclusions are not as firm as you might have hoped, but that in itself is not a reason to not read this book if the era, the genre or simply the puzzle of this case appeals to you. With thanks to Profile Books for providing this review copy. No Comments on "The Damnation of John Donellan"